The Casa Med Classic FS Low Bed offers the highest levels of functionality, safety and comfort and brightens up any room with its classic design and natural beech effect. Price includes delivery & installation. It features electrically operated backrest, legrest and knee-break. The bed can be quickly lowered in an emergency using the quick-action bolt mechanism. Assembly is quick and easy and requires no tools. 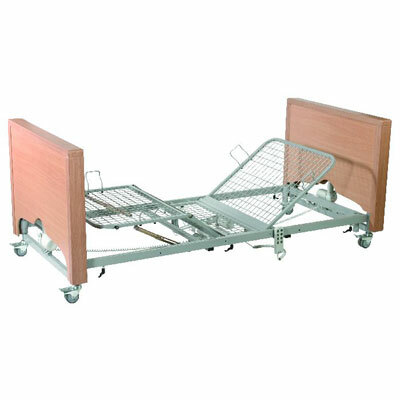 When the bed is not in use it can be separated into 4 sections and stored on transport stands, thus allowing for safe and compact storage. The very low minimum height of 23cm (not including mattress) helps to prevent injury if the user is susceptible to falls from the bed. The bed has been designed and tested to take a maximum user weight of 140kg (22st). Delivery of this product will be made directly from the manufacturer in approximately 5 working days. Delivery, Installation and demonstration are all provided as standard.The product is also supplied with comprehensive set-up and user instructions. If you have any questions about the product then please call our customer services department on 0800 910 1864.